Bankrupting the government always ends in violence. Leaving out the Yuang, China had four dynasties in a row which lasted for about 300 years each. America, in contrast, has been a going concern in more or less its present form for just over 200 years. There are relatively few citizens or politicians who have much confidence that America can make it to 300 years without a major overhaul. How did the Chinese do it? Children had a duty to obey their parents. Parents had a duty to obey the government. Government officials had a duty to look out for the welfare of the people. It's not hard to see why Confucianism gained the status of a state religion in China - Confucius taught that God Himself had declared that people had a duty to obey their government. If you were the party in power, what stronger endorsement could you want? Emperors preferred to ignore the fact that Confucius taught that the 3rd rule was the most likely to be disobeyed because government employees were greedy human beings just like like you, me, and everybody else in Washington. If the bottom-level government officials set an example of honestly working to serve the cause of the society as Japanese bureaucrats did for 30 years after WW II, people followed their example and society prospered. If officials set an example of breaking the rules as Mr. Obama's crooked cabinet officials have, people follow their example, break the rules, cheat on their taxes, and stop cooperating with the government. As more and more top-level government officials are seen to break laws and serve themselves rather than the people, lower-level officials follow their example and serve themselves rather than society. Government costs go up and economic efficiency suffers. At some point, the economy can't support the government any more and the society collapses into the abyss of the Confucian cycle. Eventually, someone else takes over, unites the country, climbs out of the abyss, and starts the cycle over again. This summer's revelation that New Jersey had misled the public about the health of its state pension funds is only the latest incident in a looming nationwide crisis. The Times didn't point out that after pension obligations consume a quarter of the budget, the unions will lobby to keep them growing to consume half of the budget and upwards from there unless something is done to slash them. There were old-age pensions in Imperial China, but people didn't live as long after they retired as they do now. It's the combination of expensive health care which helps government retirees collect expensive pensions for an extra two or three decades that's fueling the coming train wreck. A Minnesota court on Wednesday will consider whether the state can curtail pension benefits for current retirees from state jobs, in a case that could affect struggling public pension funds nationwide. The state government had been increasing the pensions of past retirees by 2.5% every year. They aren't trying to cut pensions, they're just trying to avoid increasing them. Since this would cost each retiree an average of $28,000 or so, the retirees sued. The state is saying that what the legislature gave, the legislature can take away, which seems right to us taxpayers. As voters are becoming more and more aware of how public sector employee unions are driving up taxes and cutting services, they're less and less eager to pay their hard-earned taxes into retirement funds. The Minnesota state employees union reluctantly went along with not increasing the pensions. There are other favorable straws in the wind. The Republican governor of New Jersey has faced down the employee unions, urged voters to reject school budgets, and is otherwise attempting to reign in exploding government costs. Gov. Schwarzenegger is demanding that the California legislature roll back a pension increase they passed 11 years ago. This is all to the good. Confucius never imagined democracy. In Confucius' view, virtue could flow only from top to bottom because there was no way other than rebellion for citizens to affect their government. 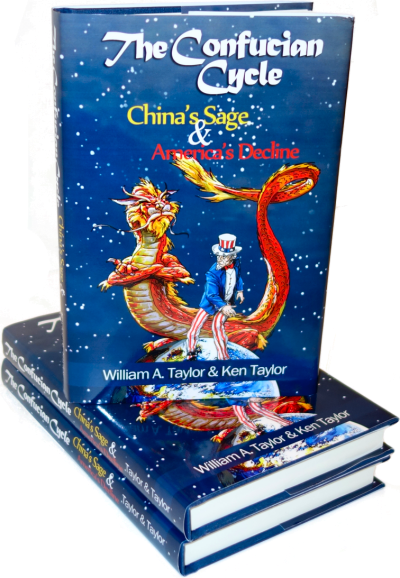 We had hoped that American voters would beat the Confucian cycle by getting rid of non-virtuous officials via the ballot box. We hoped that as voters got tired of the waste, fraud, bloat, and outright cheating, they'd elect politicians as in New Jersey and Minnesota who had the courage to take on the public unions and cut spending. The stakes are high - current spending and regulatory trends will wreck our economy. The preferred way to fix this is via the ballot box, but if the ballot box fails, we'll collapse into anarchy which can be put right only by the bullet box. We thought that Gov. Christie beating back the unions in New Jersey, Minnesota cutting back, and the governor of California trying to cut back were signs that things were going in the right direction. Unfortunately, while well aware of the desire of government employees to lobby for bigger budgets regardless of need, we hadn't paid enough attention to the looming entitlement disaster. Most Americans know of the coming Social Security crash - more young adults believe in alien abduction than believe they'll ever collect from Social Security. That problem perhaps could be handled; alas, there are myriads of other programs which are also going to cost more than we can pay. At the same time, the fraction of American households not paying federal income taxes has also grown-to an estimated 45% in 2010, from 39% five years ago, according to the Tax Policy Center, a nonpartisan research organization. Follow the math here. Nearly half of all households are benefiting from government payments in some form. Nearly half of our people do not pay income tax. That creates another recipe for disaster that never occurred to Confucius - a majority of voters won't want to cut taxes, they'll want taxes and spending increased to benefit themselves. The Europeans have traveled further down this road than we and it's proving difficult to make cuts. French workers are rioting to protest Pres. Sarkosy's plan to increase the retirement age from 60 to 62. The Greek parliament faced down rioters to cut government spending earlier this year, but it remains to be seen whether the cuts will actually go into effect. Sometimes it works. The German government slashed unemployment benefits in 2004 which prompted many workers to actually find work. This helped with Germany's recent almost-boom, much as Mr. Castro hopes that laying off a half-million government employees will help Cuba's economy. As encouraging as signs of politicians being brave enough to cut public pensions and other government spending are, it's going to take even more courage to start slicing away at these other entitlements. Confucius used to say that there was no way to save the society once government spending got past the tipping point; people might as well rebel and get the collapse over with. Have we reached that point? Can we elect politicians who are brave enough to go after all spending? Or will we continue to spend ourselves down into the abyss of the Confucian cycle? There's an important election coming up. Ballots or bullets: which will it be? American Thinker had a good article suggesting that Western-style governments actually stop expanding at some point because it hurts them too much to continue. They won't choke themselves to death.